Here's my January block for Block Swap 2. We don't have a group blog (yet?) but it is for Hope who blogs at Going Sew Crazy. The fabrics are mostly hers, but I added in some aqua check strings, red dots, a little bit of Neptune lime green, and one strip of Hushabye pink dragonflies. This is my first time making a string block. I made this friendship bag as part of my prize donation for Jacquie's Joy in the New Year UFO finishing contest. I used leftover charms from my baby's latest charm pack dress to make it, but I mixed it up and used some 1.5" strips and some 2" strips. I still need to fill it with some goodies.... working on that. I finished 3 of my 6 UFOs I'd hoped to get done at the start of the contest. I'm definitely going to make another one of these. Lauren likes purses so maybe I'll modify the handles on this to make her a little toddler purse/tote. I wanted to share some of my sewing and blogging goals for 2010...here goes! Write in the blog about 4 times a week. This one isn't set hard and fast though, I will feel ok if I need to do it a little less and I will feel great if I do more! Create more tutorials and patterns for you. First off, I am going to get back to my Simple Squares quilt pattern and finish up the sashing and cornerstone instructions. The baby quilt instructions will be complete after that, and then I will also be sharing the fabric requirements, the plain sashing, and star in sashing instructions to complete the throw size version of this quilt. 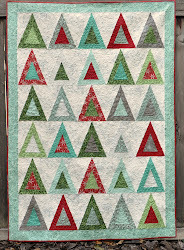 I hope to get this all completed in January and would love to see if any of you use this pattern for your own quilts! Finish my last 3 UFOs from the challenge. These are: my watercolor quilt aka insane quilt project, my small Recess quilt, and my red/blue scrap quilt. Make more clothing for my kids and myself! I have so many ideas for dresses or outfits for my little girl. I have a few things I'd like to make myself. And I'm probably making spring dress shirts for the boys. Make 2 baby quilts for new babies in the family. And finally, have fun and learn new things! What are some of your goals for 2010? Or do you skip goals and go for inclinations? And do you say twenty-ten yet, or are you still saying two thousand ten? I love that string block! 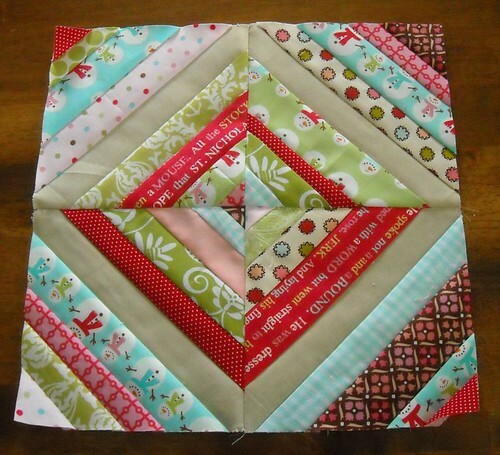 Very nicely done :) Totally in love with your watercolour quilt... can't wait to see it finished! Great looking block! Happy New Year to you too! Love your block! great colors. Your goals sound great. Mine is too keep up with my blog and sew, sew, sew! great string block..looks like a pro! i like your goals...im in line with those too. hope to get moving on a color wheel quilt and crayon wallets! Love the block and bag;) I too want to try sewing something that I can wear. It has been a long time and the last time I swore I would not do it again so we will see how it goes this time! What great goals. I love them. I'm in love with string blocks! When we were chatting last night, I said I wanted to do a couple of quilts this year. I told you about the whirlygiggle one for Trey, but not that I also want to make a string quilt similar to this: http://www.filminthefridge.com/2009/04/24/a-colorful-string-quilt/ for our bed. Oh, and when I suggested to Trey that the whirlygiggle one would be cute with denim, he thought that was a great idea! So thanks for the suggestion!!! My other goal for the year is to figure out machine quilting, other than just straight lines with a walking foot. I haven't even tried in the last couple years because previous results were so bad. 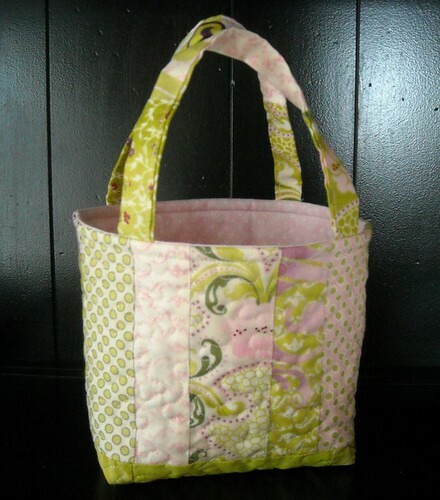 I love the fabrics you have used for the friendship tote. Love that tote...what is it about bags that I love them so! These are great goals/inclinations - and seem to be very reasonable! Always got to build in some slack!